Joy is having the full experience of all the vibrant energies of life. Are you ready to experience joy? It sounds like a full-bodied, full-throttle experience. It’s not necessarily neat and clean and pristine. Joyful living is messy living; it is fully engaged living. Joyful living is jumping into your life fully! Joyful living is like the amazon jungle; it is explosive and maybe even chaotic. 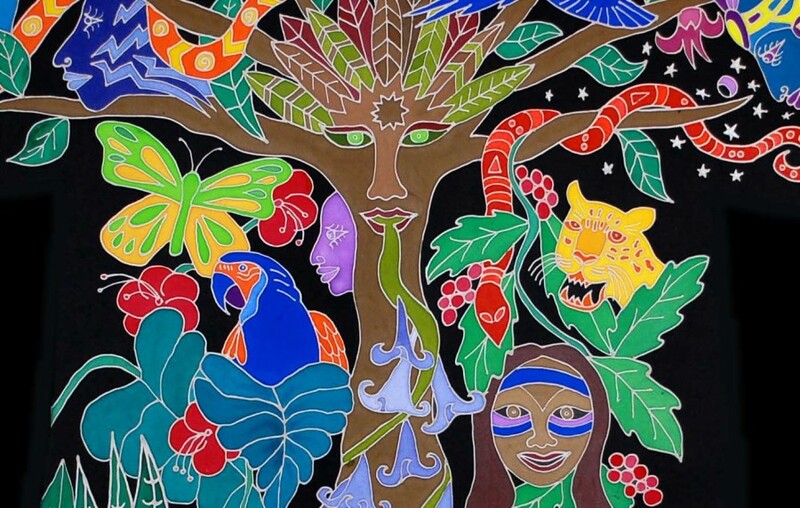 The image above is a depiction of the amazon jungle on Megan’s sixth sacred robe for Joy. It shows the intense energy of generative joy in the jungle environment. In the rain forest there is life, death, decay, fighting for sunlight, poisonous frogs, vines and hallucinogenic plants. There is the humming vibration of life in its most raw form. All life in the jungle is vibrating a joyful, primal song. It is naked and free and unencumbered by thought, mind, judgment or censure. Joy is just what it is. When you are vibrating at your true resonance unencumbered by thought, mind, judgment or censure, you are open to experience all the energies of life. Think about peak experiences, when you climbed to the top of the mountain, finished that race, birthed your child. During peak experiences you are totally invigorated with the joy of the moment – conquering, seeing, hearing, touching, birthing and creating. Joy is about fully experiencing your life no matter what you are doing and no matter where you are. Many of you shut down or turn down the full-throttle volume of joy. See how your system can tolerate more joy. See how you can stand in the joy vibration and open up all your senses.